Having endured the eternally happy-clappy Trolls, the thought of another musical animation based around a singing contest didn’t have me thinking good thoughts. How wrong could I be! Sing, from Illumination Animation, the team behind Despicable Me and the man who gave us the brilliant Son of Rambow, is a pure delight from start to finish. A film that has more crammed into it than most live action features that you can’t help but be swept along with. Buster Moon is a koala who has taken his father’s beloved theatre and run it to the ground. Without any money to pay his staff or the bank, Buster has to come up with a sure-fire hit. Instead of the usual route, he decides to hold a singing contest open to everyone, although a misprint of a flyer brings more attention than he expected. Assembling a group of individuals, the long and bumpy road of putting a show on could cost Buster more than just his theatre. Garth Jennings, who wrote and co-directed the piece, hasn’t just thrown together a collection of two-dimensional characters and a series of slapstick gags and splashed around some colour to keep the kiddy-winks happy. He has created the world, not too dissimilar to that found in Zootropolis, where the animals are human-like, and has allowed enough time for each of the participants to have a backstory or give us enough information to take these creatures to our hearts. What we have is a pig called Rosita, who has hundreds of children and a husband who doesn’t really know she exists; a gorilla called Johnny, whose father is a criminal longing for his son to become part of the band; an elephant, Meena, who has a beautiful voice but suffers from shyness; a mouse with a passion for swing and jazz as well as for the ladies and gambling; I could go on. Each one is neatly drawn out so we can relate to their plights, their reasonings why they have to enter the contest. Not to win it but to just be there. 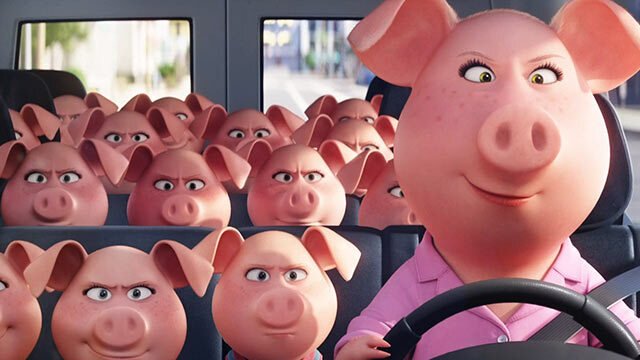 Of course, it being an animation, there are flights of fantasy and moments of silliness (a buffalo with a bad case of wind) but this isn’t a film that relies on childish behaviour to attract the attention of its viewer. This is a film that has plenty of heart and it wants to share it with everyone. It also has plenty of invention, none more so than in the auditions, when the animals come to the stage to impress with perfectly suited songs for them to sing, (a snail performing “Ride Like The Wind”; shrimps singing “Single Ladies”). The other big winner for this film are the songs. All performed and orchestrated perfectly, they are delivered to make the audience have a smile on their faces. From the opening number, a wonderful rendition of the Beatles’ Golden Slumber as performed by Jennifer Hudson, sets the film up nicely. These aren’t going to be the level of cheery pop that Trolls inflicted us with. These are songs with meaning, classily laid out. By the time we get to Stevie Wonder’s Don’t You Worry ‘Bout A Thing, we are well and truly won over. The voices also fit the creatures perfectly. 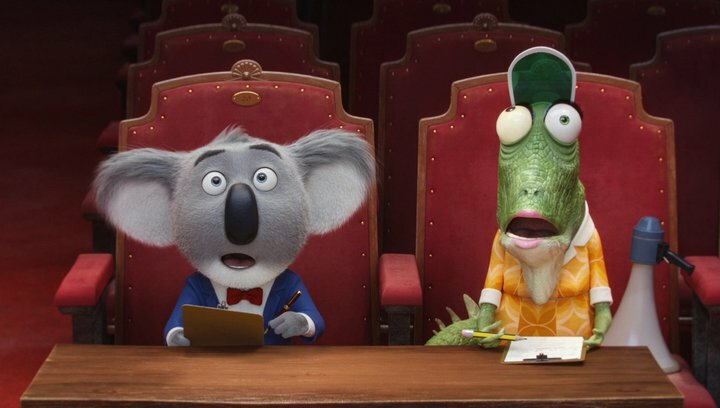 Who would have thought Matthew McConaughey would be a perfect koala, injecting charm to this hustling theatre impresario without a hint of Australian or Shakespearian theatrics. The rest of the cast, from Reese Witherspoon’s, hassled Rosita to Targon Egerton’s cockney Johnny, they are fit nicely. I never thought that Sing would win me over but it did. It’s clever, devilishly cheeky in places and just pure, good, old-fashioned entertainment that has enough for the younger audiences to enjoy while never forgetting that the adults will enjoy it as well. In fact, the screening I attended was nothing but adults and they seem to be having the time of their lives, as was I. Delightful.